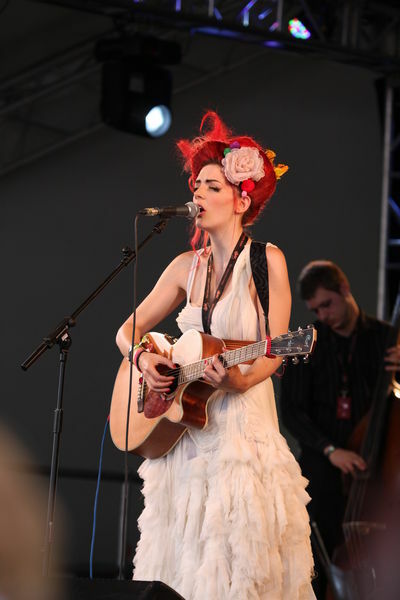 Gabby Young and Other Animals are an eccentric eight piece British pop band, bringing together gypsy, folk, rock and jazz. Onetaste website described the music as having "Incredible soaring vocals, heart-breaking lyrics with wild cabaret style to lose yourself in". The band is fronted by Gabby Young, and supported by the Other Animals using a wide range of instruments, most notably trumpet, trombone, piano and clarinet. One album has been released, originally through Gift of the Gab Records. The official web page now states that the success of the album through Gift of the Gab has resulted in a major distribution deal, and that the album will be re-released in September 2010, along with the first single, "We're All In This Together". The album topped both Amazon UK's folk and rock download charts during the week commencing 27 June 2010 as part of the 'Storm the Charts' campaign. The band has been reviewed positively by many of the UK's major newspapers, including The Guardian, The Sunday Times and the London Evening Standard. The Guardian named the band in the list "Our anti-tips for 2010: the acts who deserve to be heard".